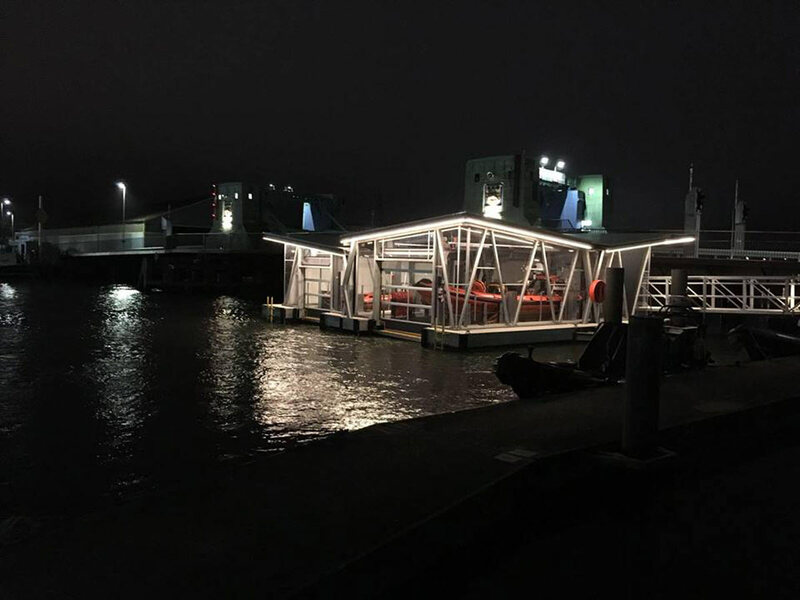 Caption: The new floating boathouse at night. There will be a D class RNLB naming ceremony as well as the official opening of the new floating boathouse at Poole Lifeboat Station. Caption: The new boathouse at night. On Saturday 23 June, there will be a D class RNLB Gladys Maud Burton D-804 naming ceremony. Poole’s newest lifeboat will be officially named at 11.30am by Poole Lifeboat rector, Reverend Lucy Holt, in a service of dedication. Although the D class boat has been on station since early 2017, her naming ceremony will be her official handover to the RNLI, who in turn dedicate the D class to the safe care of the Poole Lifeboat station. Poole Lifeboat Station will also be celebrating the official opening of the new floating boathouse because the positioning and completion of the boathouse was delayed by the major reconstruction work that took place on the Old Poole lifting bridge. Poole Lifeboat Statin therefore decided to combine both events. The boathouse will enable the lifeboats to be ready to respond as well as being a sheltered place out of the elements, which will help to prolong life saving capabilities. It will keep the D class and Atlantic 85 class lifeboats safe and in pristine condition. The new floating boathouse would not be possible without the generous kind donations from supporters. Assembled by Weymouth based Sawtell Construction Ltd, the boathouse had taken shape at the old power station site from September 2017 onwards. At the beginning of March, it was put into the water in two sections and bolted into position by the old Poole lifting bridge. Designed by ECA Architecture and Planning, the boathouse will be a welcoming safe haven to all seafarers heading back through the bridges. The lifeboats went operational in the new floating boathouse on Saturday 16 June, after all the crew had gone through rigorous training of procedures. There is an opportunity to welcome groups of visitors to tour the floating boathouse and station. For more information, visit the Poole Lifeboat station website or go to the station Open Day on 5 August.